California’s Gov. 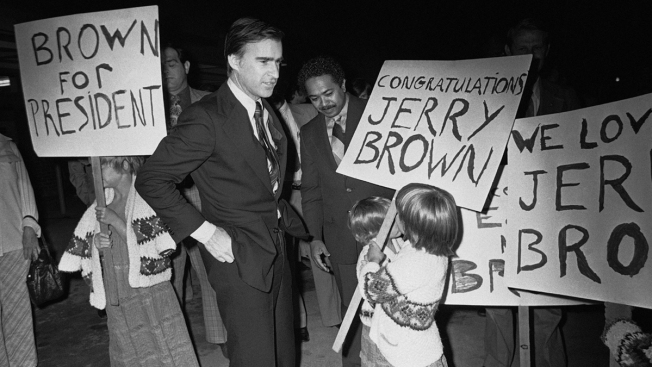 Edmund G. Brown Jr. was greeted by backers and sign-carrying youngsters upon his return to Sacramento, Calif., May 20, 1976, following his victory in the Maryland Democratic presidential primary election. It was a matter of life and death in 2015 when California Gov. Jerry Brown pondered an assisted suicide bill granting terminally ill people the right to choose when they die. Brown, who leaves office Jan. 7, has signed thousands of bills, but this one stands out to Dana Williamson, Brown's cabinet secretary at the time. Brown has honed that decision-making style over five decades in public life, including a record 16 years as California's governor, first from 1975 to 1983 and again since 2011. He used the bully pulpit that comes with governing the nation's largest state to mount three unsuccessful bids for president and urge swifter action on climate change — something he'll continue when he leaves office — and he's credited with pulling California out of a financial sinkhole that had observers deeming the state ungovernable when he returned to Sacramento in 2011. After losing a bid for U.S. Senate in 1982, he traveled abroad, re-entering politics as California Democratic Party chairman and, in 1992, seeking the presidency for a third time and losing to Bill Clinton. He returned to elected office six years later as Oakland mayor then became state attorney general. In 2011, he won the governorship, and his political comeback was complete.